I am a huge fan of Metal Gear Solid, to the point where about half the things I say are stupid references to that game. I love its oppressive atmosphere, the tonal clash of political drama and cartoon silliness, and most of all, the shameless gamey-ness of the whole thing. So when I caught a glimpse of a character running around in a cardboard box in World of Danger‘s trailer, like the worst of fanboys, I immediately decided to give it a try. Alas, like most decisions based on trailers and fanboyism, it too turned out to be ill-informed. A few missions into World In Danger, having partaken in its shoddy stealth, mindless action and unengaging plot, I realized: this isn’t a tribute to Metal Gear Solid. It’s a tribute to The Phantom Pain. 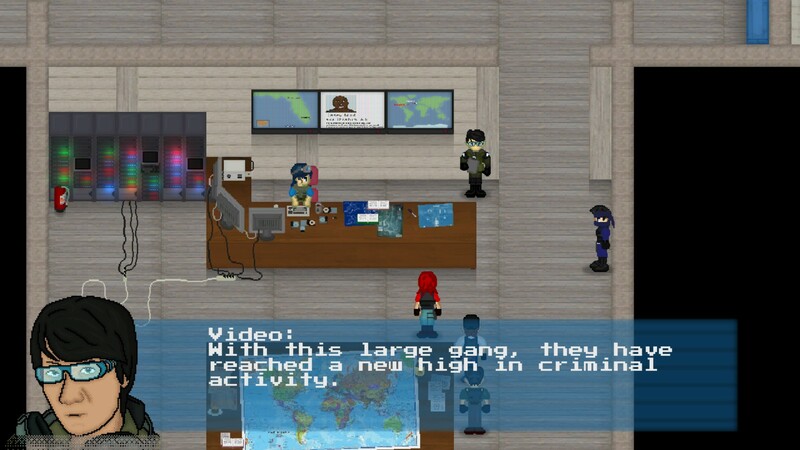 World In Danger is a top-down action game with a simple enough premise: in the future, the world is bad, so badasses decide to form an army with no national allegiance, the so-called World Army, that only exists to do good – sort of like Big Boss’ MSF meets the Care Bears. As you go through missions, you slowly uncover a dark conspiracy undertaken by a shadowy bad guy, delivered in cutscenes rich with exposition. Not the most original of starting points for a video game story, but it doesn’t pretend to be one, either. It’s all just an excuse for our protagonists to get out there and shoot things in the name of saving the titular world from the titular danger. And despite the occasional conceit of rescuing hostages or disarming bombs, that is what World In Danger is all about: running around shooting bad guys until they all die. Although the game apparently expects you to employ stealth, with the alarms and enemy indicators going off once you’re spotted, there are no silent takedowns, and enemies call their buddies the moment you attack them, making it impossible to get kills without alerting every baddie in the level. You can use stealth, but to be more honest, you can’t really use stealth. This would make World In Danger a standard top-down shooter, which wouldn’t be a bad thing on its own. The problem is that even as a straight-up shooter, WID has a lot of issues. For one, your characters are pretty slow and enemies hit hard, meaning that you have to rely on cover to survive. This would make WID a cover shooter, but it has no cover system, so it’s more of a corner shooter, where you constantly move around whatever obstruction is available to take some pot shots at enemies and then run back. That’s when you are confronted with the game’s awful AI, with enemies either stupidly walking over mountains of corpses into your line of fire or waiting around the corner for you to pop back out and shoot them again. The only time you’re likely to die is when the game’s poor collusion mechanics prevent you from going around a corner to avoid getting shot. World In Danger makes a big deal of the fact that it lets you choose from four different characters, but with the exception of the character models themselves, they are mostly indistinguishable. They walk pretty much the same, they shoot pretty much the same, and they each have a machine gun and a pistol, the latter supposed to serve as a last resort in case of running out of ammo for the former, which never happened for me. The only exception to this is Marco, the Ninja, who looks like what would happen if Solid Snake took a page from Ryu Hayabusa fashion guide. Marco has no pistol, but does have the ability to “shadow step”, which is what is known in every other action game as a dodge. This makes him easily the most functional in combat, putting into question why anyone would ever pick any of the other characters. This isn’t to say that World In Danger is terrible. At the very least, it is a functional top-down shooter. But there’s nothing special about it, and many of the things it does to try and be special end up feeling unnecessary. There’s some fun to be had here, but even at 4.99$, it’s hard to justify getting this game over the many better and more polished games available on Steam for around the same price. But hey, how many of those games have a character that looks exactly like Kojima’s cameo from Ground Zeroes? As if I needed another reminder that that game exists.